60 x 400mg Veg. Caps. All the Proven Benefits of Green Tea in a Handy Vegecap. Green Tea has been a staple part of the Chinese diet for many thousands of years. Modern science has revealed this to be for good reason. Many people find that the bitter taste of Green Tea is not to their liking, and a simple vegetable capsule gives you all the benefits without the fuss of brewing numerous cups of tea! Green Tea has been studied extensively. Many vitamins and minerals are present, but it is not these that deserve the attention, but rather the polyphenols, these actively strengthen your immune system and fight free radicals - a major cause of the signs of aging. When you choose our high potency extract, you can be sure that you will be enjoying the best. 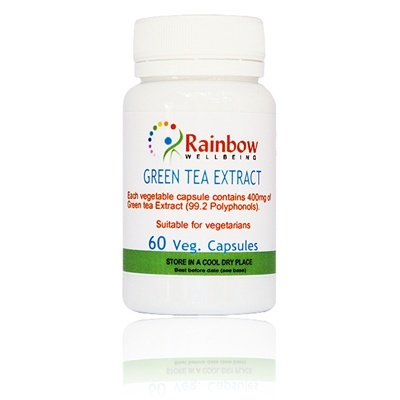 To ensure you enjoy the maximum benefits, we supply a standardised 99.2% polyphenols Green Tea Extract. Green Tea is also a helpful aid for weight management. 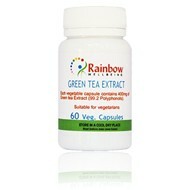 100% pure extract of green tea in a vegetable capsule, no additives of any kind.